Voice of Reason:::Roger Tan: Where are you, daddy? It has been more than two months since 83-year-old Tan Sue Yong, who is suffering from senile dementia and Alzheimer’s disease, wandered off from home. Where could he be? His family is appealing to the public for help, reports ISA ISMAIL. FIND HIM... Tan has been missing since May 23.FATHER’S Day this year has come and gone for lawyer Roger Tan without much celebration. He and his family have been spending days and weeks going to various non-governmental organisations, religious institutions and newspapers to seek help. His father is missing. This is not the first time but 83-year-old Tan Sue Yong has never gone missing for more than two months before. Every time the older Tan goes wandering off, someone would pick him up and send his home. “He would wander off in jungle every day,” says Roger, of his father. “I suppose he thinks it’s his rubber plantation.” When Tan did not come home on May 23, the Yong Peng Police Field Force was mobilised to comb the surrounding jungle. They searched until early next morning but still did not find him. The older Tan suffers from senile dementia and Alzheimer’s disease. He was last sighted on an express bus in Yong Peng on the evening of June 13. Having learnt to use public transport, Tan is most probably on the move, wandering from town to town. Notwithstanding dementia, Tan is a healthy and hearty old chap. Once, Tan rode his 20-year-old motorbike to Malacca from his home in Yong Peng. He was brought home by a member of the public who had found him wandering around town. Since then, Tan has been deprived of his trusty old motorbike and confined to home. But even a locked gate could not keep this restless senior citizen from going out as he would use a ladder to climb over it. When they took away the ladder, Tan would rattle the gates until someone lets him out. Tan’s family had previously put him under medication to keep him calm but eventually decided to let him be. Medication had caused him to develop hallucinations and made him unable to look after himself. 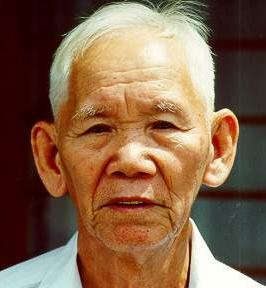 Tan had toiled selflessly until he was 70. At 60, he would often dye his hair so his employers would not dismiss him for being too old to work. “He had worked hard in his younger days to bring us up,” recounts Roger. Tan had worked as a labourer for RM7 a day. After 1960, he took up contracts to clear jungles for plantations. “Once, when I had done badly in my exams, I went to tell my father, who was working in the estate. He did not scold me but as he turned his head to carry on with his work, I saw tears rolling down his cheeks,” said Roger. Roger obviously studied harder as he eventually went to England to read law. Today, Roger is still going around asking the public to help look for his elderly father. Please contact the Yong Peng police station at 07-4671222 if you find Tan Sue Yong or if you have seen him recently. Those interested may know more about the search at this web site: www.rtkm.com.my/dad.